If you’re after the classic James Bond look for your groom it just has to be a tuxedo. The tux is a fabulous choice for instant glamour and will make your groom and all the ushers look incredibly suave and sophisticated. Here are three golden rules for wearing a wedding tuxedo. Although the old rules claim that a tux shouldn’t be worn before 5pm, the classic tuxedo is ideal for a formal daytime wedding that will continue well into the evening. A less formal daytime affair will require a well cut suit in black, navy, or charcoal, instead of a tuxedo. For a formal daytime wedding that will end in the early hours of the evening, you may wish to opt for a morning suit with a tailcoat and pinstripe trousers rather than a tuxedo. 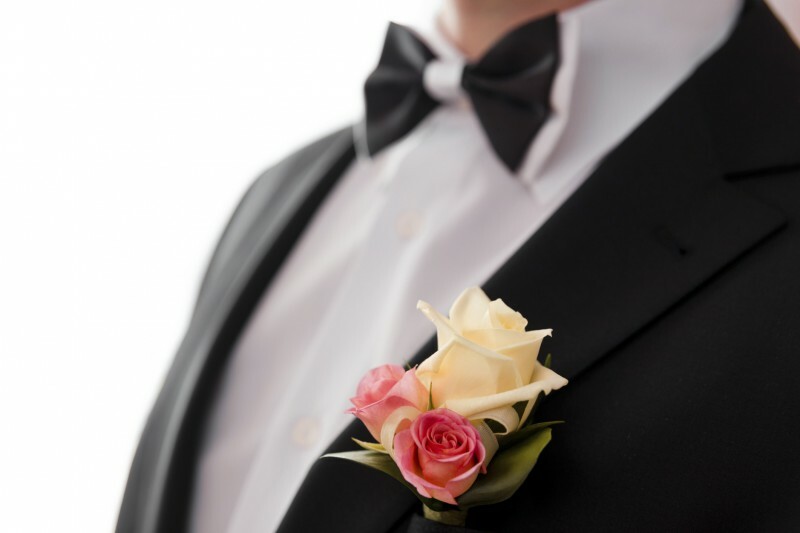 A classic tux is perfect for an upscale evening wedding. For an ultra-upscale evening wedding, the tuxedo should be upgraded to white wedding tie. This stands for a black tailcoat, black trousers, white shirt, black waistcoat or cummerbund, and white bow tie. Bulkier grooms can look a bit thinner with a single breasted wedding tuxedo with a single button and a low button stance. Thin grooms can look bulkier with a double breasted tuxedo with broad shoulders. A single breasted three button jacket will enhance the frame, and won’t create an oversized look for a smaller groom. Tall slim grooms can get away with almost any kind of tuxedo, but other shapes and sizes must consider what they wear. Black tuxedos have a slimming effect, whereas lighter coloured suits will provide you with bulk. Waistcoats are more sliming than cummerbunds since they draw the attention up towards the face instead of the waist, so cummerbunds should only really be an option for slim grooms. Shorter grooms should opt for a short jacket to elongate the legs, and should consider dressing in trousers with a satin strip down the side. Tall grooms must be sure that their jacket arms and trouser legs are adequately long, and can create a good look with a longer style jacket. Flat front trousers are more flattering than pleated trousers, but taller thinner grooms can wear either. The fit will dictate the overall look of the groom’s wedding tuxedo. The hem of the trousers should end just beneath the top of the laces, or where the laces would be if the groom wasn’t dressed in slip on loafers. The hem of the jacket should protrude just below the bottom, with the vent staying closed, and the shoulders should fit comfortable without the pads extending out to the sides. The cuff of the shirt should stick out slightly from the jacket sleeves, ending just past the wrist bone and the shirt collar must lay flat at the back and sides shouldn’t have any gaps.